← What Happens When Markets Are More Free? 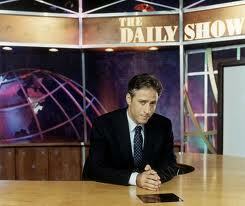 I am a huge fan of the Daily Show. I think it’s well written and funny. I say this knowing that it’s often the conservatives who are on the receiving end of the jokes. But serious; funny is funny is funny. But the rally these two guys held before the election was just, well, funny. Part of the reason it was so bad, and I mean really bad, is that the two guys seemed entirly unsure of what character they needed to be. Comfortable in their roles on screen, they had to face the fact that these people rallied to see them. And they weren’t sure which side “of them” they wanted to see. In some ways, the draw of these two gifted comedians is just that, comedians. But they sense, correctly, that the folks came for a more serious reason. And Stewart and Colbert are not serious people. Or, when they are, are no better at being serious than other normal people. They are gifted comedians. They are stock average serious people. So, in order to spruce of the game, they had to rely on a theme, a name, a reason. And so, “Restore Sanity and/or Hate” was chosen. …it ridiculed voters’ fearfulness and pretended to bipartisanship. There is, Mr Beinart maintains, ample reason for fear, and nobody’s dull enough to think the gathering wasn’t a pep rally for downcast Democrats. Fair enough. But Mr Beinart cuts deep, I think, when he observes that the focus on “sanity” is demeaning to the tea-party movement and its sympathisers, and reflects the left’s failure to engage broad swathes of the electorate by arguing for the liberal agenda in terms of liberty. Finally. People are beginning to understand that serious conversations concerning Liberty does not render one “insane”. Quite the opposite. This entry was posted in Liberty, Politics: National and tagged Democrats, Jon Stewart, Leftists, Stephen Colbert. Bookmark the permalink.